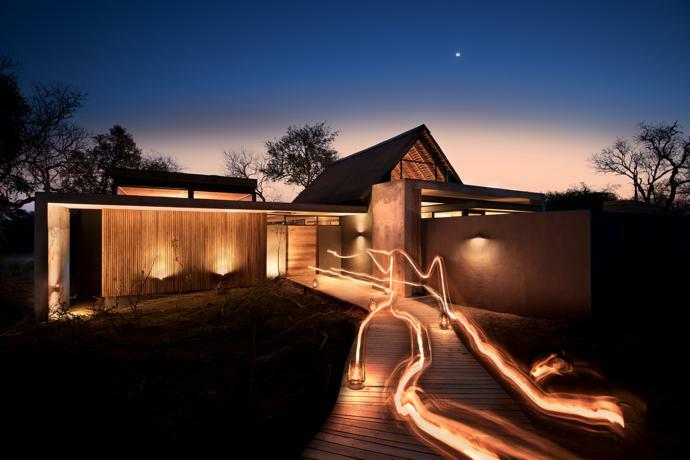 In the evenings, lanterns and a brazier are lit on the fire deck next to the pool at Fish Eagle Villa. The Pershing chairs and stool are from Weylandts. 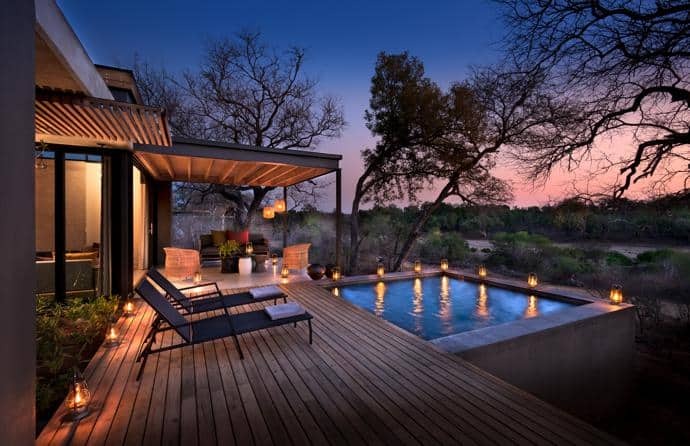 Fish Eagle Villa, Ivory Lodge’s exclusive two-bedroomed Villa, comprises two private suites that are connected by an entrance hall, lounge and study. The star jetty on the left and the fire deck are two places where one can sit in quiet contemplation of nature. Below the deck is a treatment room and gym. 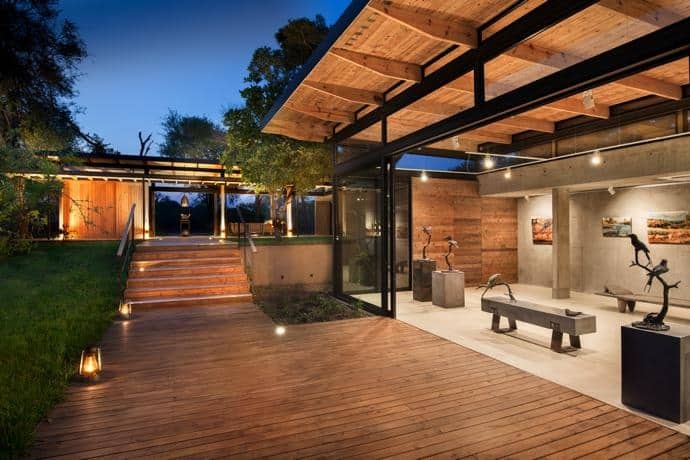 The nine villas, named in reference to indigenous birds, are connected to the communal areas by wooden walkways. 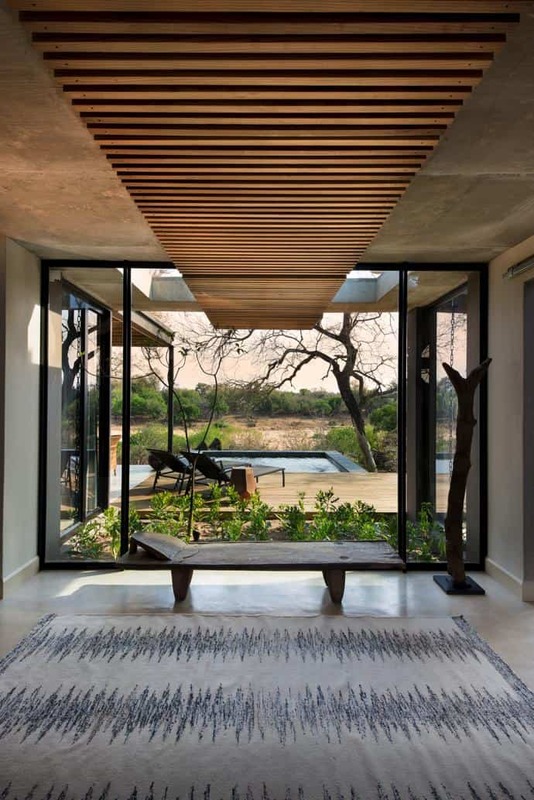 Generous timber overhangs protect the reception lounge from rain and direct sun, but the absence of partitions brings a very elemental connection to the bush. 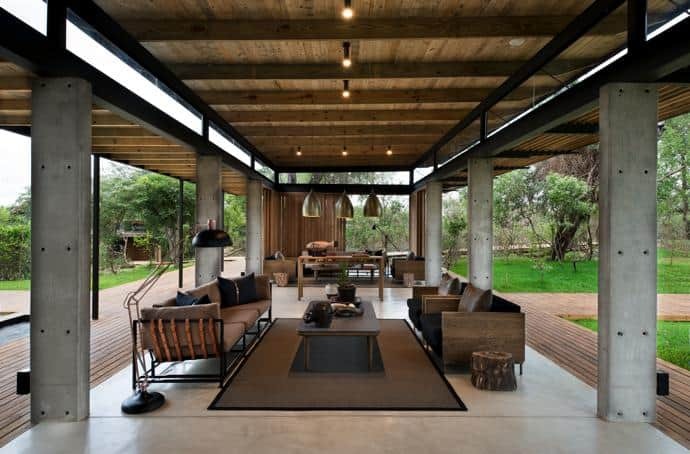 The use of concrete, wood and considered furniture contribute to the lodge’s contemporary aesthetic. The larger furniture pieces were designed by Meg and custom-made by The Noble Collective for MT Spaces. The pendant lights are from Amatuli, and the floor lamp is from Sixth Floor at Superbalist. 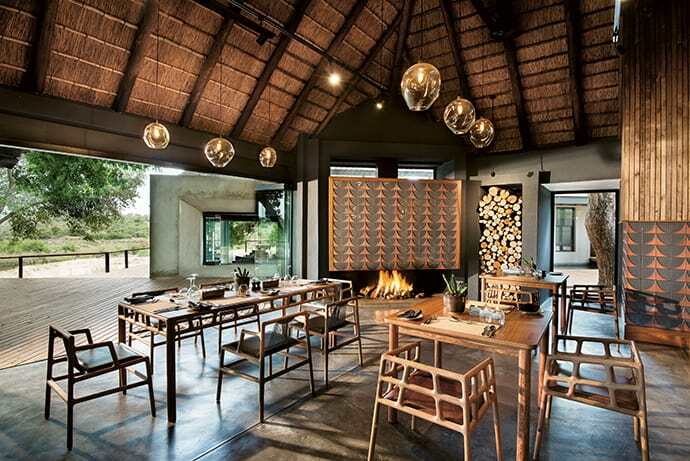 The dining area reflects the lodge’s focus on privacy, giving guests the options of smaller tables and booth seats. The tables and chairs were made by David Krynauw and the pendant lights were made by Greencraft Lighting. 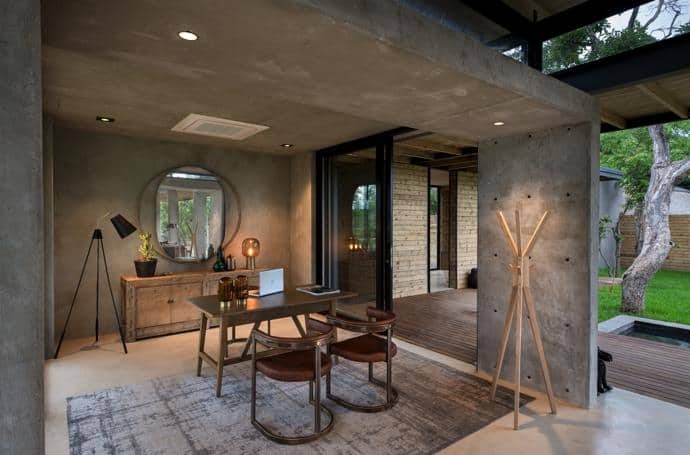 The understated reception area features a desk made by The Noble Collective, chairs from Egg Designs, a floor lamp from Weylandts and a rug from Hertex. Hanging on the walls of each of the luxurious bedrooms is a large-scale photograph of bird feathers by Dook. 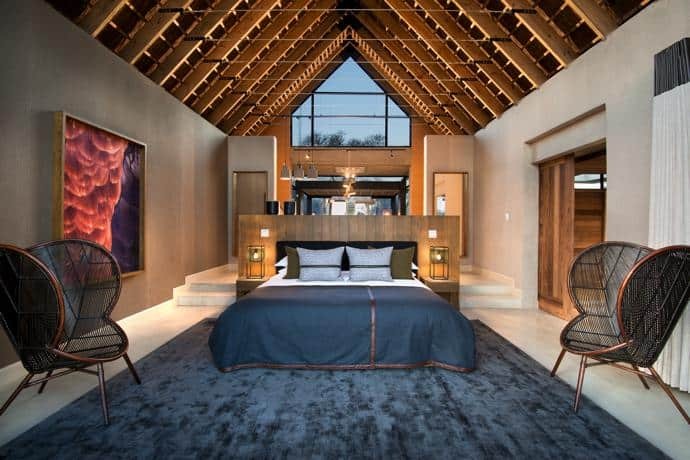 The wing chairs and bedside lamps are from Weylandts, and the rug is from Hertex. 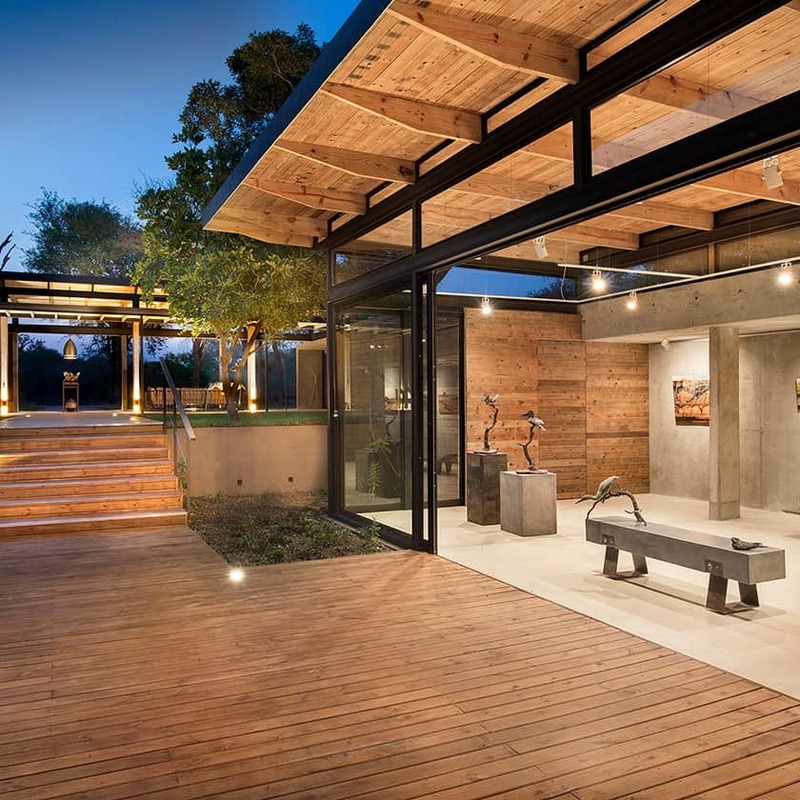 The addition of an art gallery in the public area was a move to elevate South African arts beyond the traditional gift shop. On display are works by the likes of sculptor Robert Leggat and painter Walter Voigt. 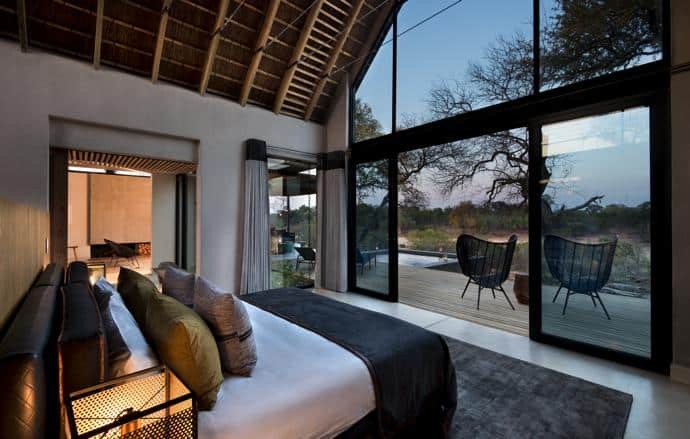 Huge glass sliding doors connect a bedroom to the outside. 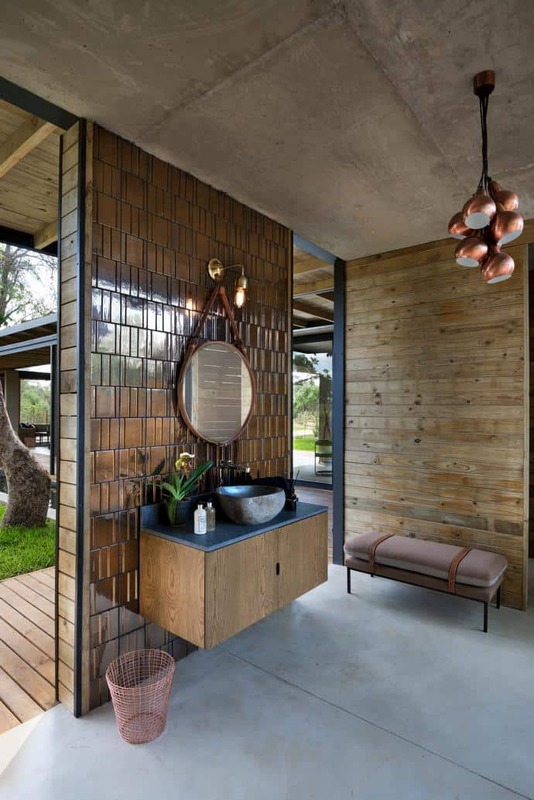 The guest loo in the reception area, with a wall clad in tiles by Rialheim and a cluster of copper pendant lights from Illumina. 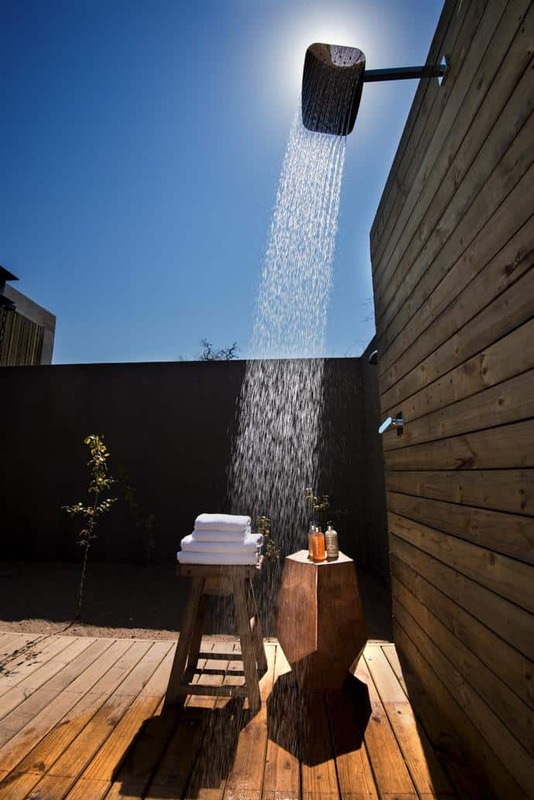 All nine villas have both an outdoor shower in addition to the indoor one. 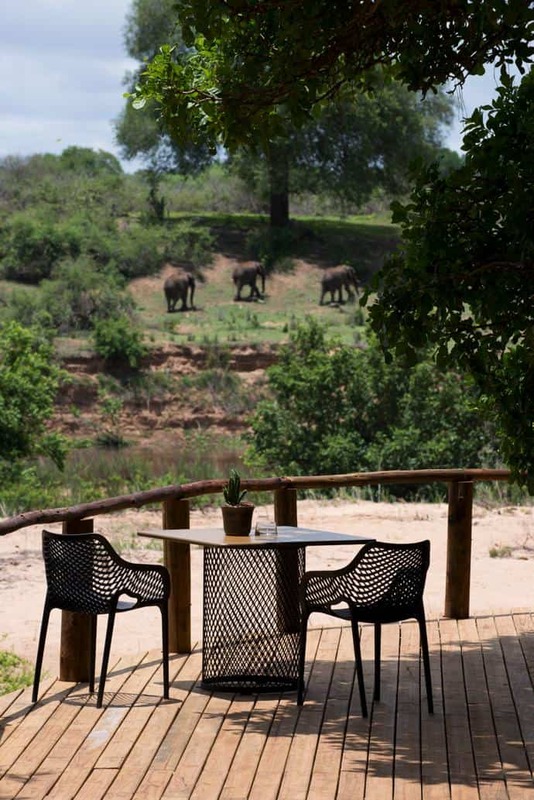 On the main deck, which overlooks the Sabie River, guests can sit in the shade of a towering Natal mahogany tree. The table was custom made by The Noble Collective and the chairs are from Chair Crazy. 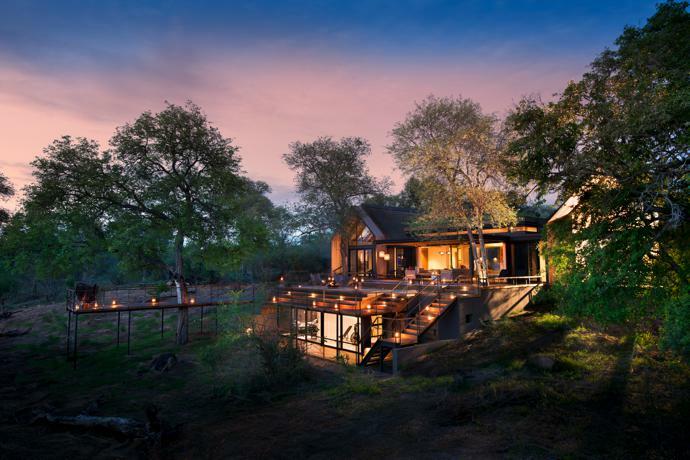 As day turns into night in the Bushveld, the private deck of your villa is the best place to be. 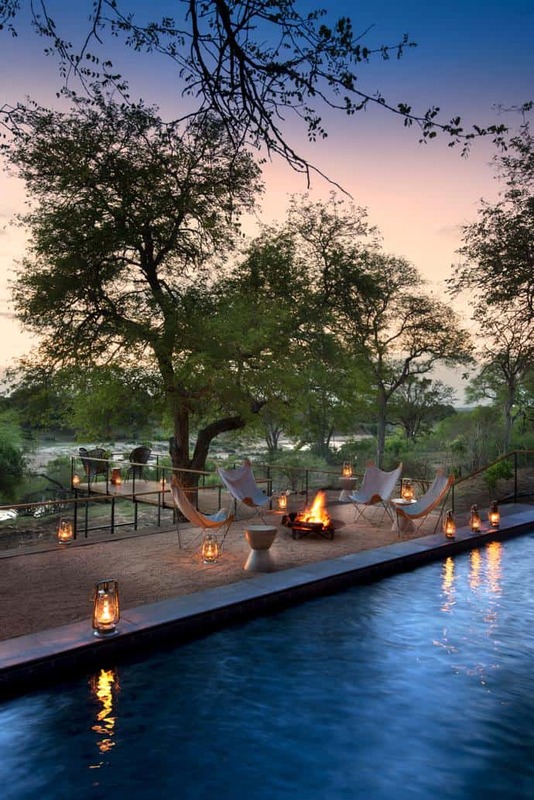 The pool loungers are from Macalli and the Malawi chairs from Amatuli.